I was very impressed by the Design. It was very easy to operate. I live in Las Vegas, and the radio spectrum is pretty full on our radios, however once I was able to find a frequency that worked, I found that the device did a nice job with the handsfree communication with my cell phone. One option that would enhance the experience of using the device would be a longer stalk on the part that connects to the cigarette lighter for vehicles like vans and trucks, even if it were an add on option at an additional fee that would be help full. The setup is very easy, and the device works well. The audio quality varied greatly depending which vehicle I tested the device in. Overall I was impressed with it’s handsfree capabilities. It worked in a decent manner when it came to the streaming of music over the radio. 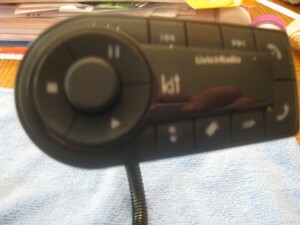 I liked the external input which allowed me to play music from my Android phone over my car as well as my son’s ipod. The Livio Radio Bluetooth Internet Car Kit’s controller module looks sharp. It’s made of matte black plastic, with a pleasant textured surface and a faux metal flake finish. It measures 1.9 by 3.6 by 1.1 inches (HWD) and weighs 1.6 ounces by itself, or 2.9 ounces with the gooseneck adapter attached. bring online audio to more people, in more places. Thank you for your purchase and enjoy! information is available at www.radiotime.com. mobile phone for hands-free calling. to your mobile phone for easy music streaming. connected audio player (MP3, CD, etc). auxiliary (AUX) input. Use with the included 3.5mm AUX cable. 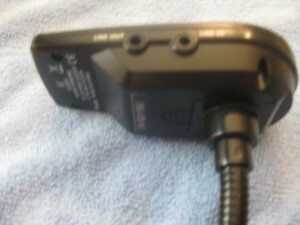 chargeable devices like phones and other electronic devices. To sum it up, I was pleased with the device, its quality, the functions it provides. It shined the best for its handsfree capabilities. It was easy to tune to the fm frequency. I was impressed with the call quality that it provided. It needed an option for a longer stalk for vans and trucks. 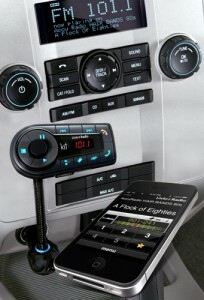 Overall I found it to be an excellent product and is worth considering as an option for those that want handsfree capabilities in the vehicle as well as the fm modulation features such as for streaming and using other devices in your vehicle for those of us who do not have an auxiliary input. Be the first to comment on "Livio Bluetooth Car Kit for Android by Livio Radio–a tech review from Technewszone"